The Samsung Gear Sport smartwatch is the Gear S3's sportier brother. It’s aimed at fitness fans, and it’s packed full of exciting new tech. Let’s check it out. The Gear Sport isn’t your typical big and chunky sports watch. In fact, it’s a more compact version of the Gear S3. With its attractive stainless steel face, it has the look of a stylish smartwatch rather than one that’s been designed for fitness fanatics. Just like the Gear S3, the Gear Sport comes with a rotating bezel to help you navigate through the interface. It’s works really well for rotating through lists, and you can also quickly dismiss notifications. You can also use the touchscreen itself to tap and poke your way around, and there are a couple of buttons on the side that perform a few functions, like jumping to the app launcher and turning the touchscreen off. The 1.2-inch Super AMOLED display looks fantastic. Not only is it incredibly sharp (360x360 pixels is a lot for something this size), it’s also colourful and vibrant with great viewing angles. We expected no less from Samsung, to be honest. The Gear Sport has its own apps menu, offering a handful of games and a few well known fitness apps like Endomondo and Map My Run. The pick of the bunch surely has to be Spotify though. As long as you’ve got a Premium Spotify subscription, you’ll be able to store playlists and albums on your Gear Sport, and listen to them offline. All you need is a pair of sporty Bluetooth headphones, and you’ll be able to listen to tunes when you go out on a run – no smartphone required. The Gear Sport automatically tracks all your fitness activities through the day. There’s a basic step counter (of course), and the watch also recognises when you’re running or cycling. It can also deal with more specialist sports, including tennis and football (not including the goalkeeper, presumably). All your daily activities are translated into useful information with the Samsung Health app, which also gives you a sleep tracking update every morning. The Gear Sport uses GPS to track your workouts and activities, something that’s pretty essential for any good fitness wearable these days. It also comes with NFC, so you can use it to buy things with Samsung Pay. 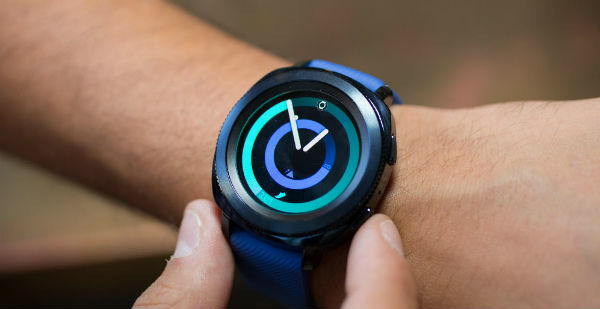 According to Samsung, you can also use the Gear Sport to control IoT devices via Samsung Connect, although that’s not something we’ve had a chance to try out yet. When it comes to battery life, Samsung ‘s claim is that that Gear Sport can last you four days between charges. That might be the case if you hardly use it and regularly turn off the display, but with normal use we were usually looking for a charger after two or three days. We like the fact that the Gear Sport has wireless charging, so you can just pop it on the supplied charging stand to top it up. And finally, the Gear Sport is fully water resistant, with a 50 metre waterproof rating. It can cope with being worn in the swimming pool, and it also has a swimming mode that stops water affecting the touchscreen. Interested? You can buy the Samsung Gear Sport from Currys right now. If you do get one, drop us a comment below and let us know how you rate it.